The MEChA club of Cerritos College organized an event to celebrate Dia de los Muertos and raise culture awareness to students on campus. Clubs were invited by the Mecha club to fundraise and raise club awareness at Falcon Square on Wednesday, Nov.1. Traditional food and drinks were sold by the Mecha club, such as pan de muerto, sweet bread, aguas frescas, and face painting. One of the clubs at the event was the Puente Program- they were selling skull lollipops for two dollars and students could decorate them themselves. Celest Galves, sociology major and member of the Puente Program and MEChA club, was at the Puente Program booth making the skull lollipops made of rise crispy covered with marshmallow and chocolate on top. “We are fundraising and giving out an expression of what Dia de los Muertos is and celebrate it and acknowledge all these people that passed away,” Galves said. MEChA offered face painting to students for six dollars with color and three dollars for a half face. Cindy Servin, psychology major, MEChA and Psychology Club member shared her thoughts on what the face painting represents. “Face painting commemorates their ancestors that passed away, the colors symbolizes that we’re celebrating [their lives],” Servin said. 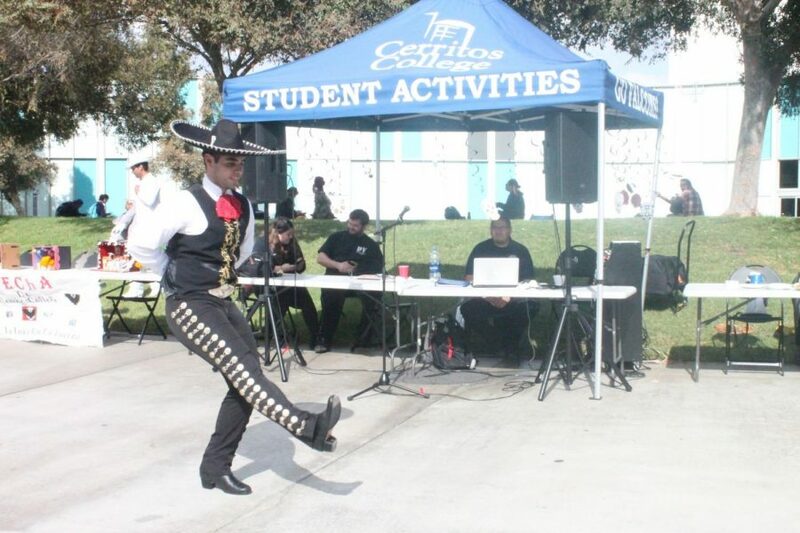 Students gathered to see a performance by two students dancing a traditional Mexican dance. One of the performers was Carlos Quezada, administration of justice major. He danced a song from Jalisco dance called “El Pascayes”. “The choreography I did was traditional and stylized from the region of Jalisco,” Quezada said. He wore a embrodied mariachi suit, with a big hat, and red bow on his neck. The second dancer was Jesus Ramirez, education major. He danced a song from Veracruz called “El Toro” in Jarocho style that involves a lot foot work than the the previous performance from Jalisco. “This dance articulates the Jarocho style which is how people from Veracruz do it. As for Jalisco, they have the person in gala so they wear a charro outfit,” said Ramirez. Students admired the altars that were donated by the Psychology and MEChA club and Bell Gardens High School to commemorate loved ones who have passed away. The altars were decorated with pictures, candles, flowers, papel picado and possessions of the deceased as offerings. Marlene Estrada, psychology major and MEChA club member says this event is great for students to know the meaning of the day of the dead. “I think students will know what the day of the dead is- they’ll be familiar with tradition, they’ll know what the traditional food is and they’ll also be aware of different clubs on campus that work well together,” said Estrada. Students gathered up to dance to spanish hits that were played by the Commercial Club which provided the music for the event.